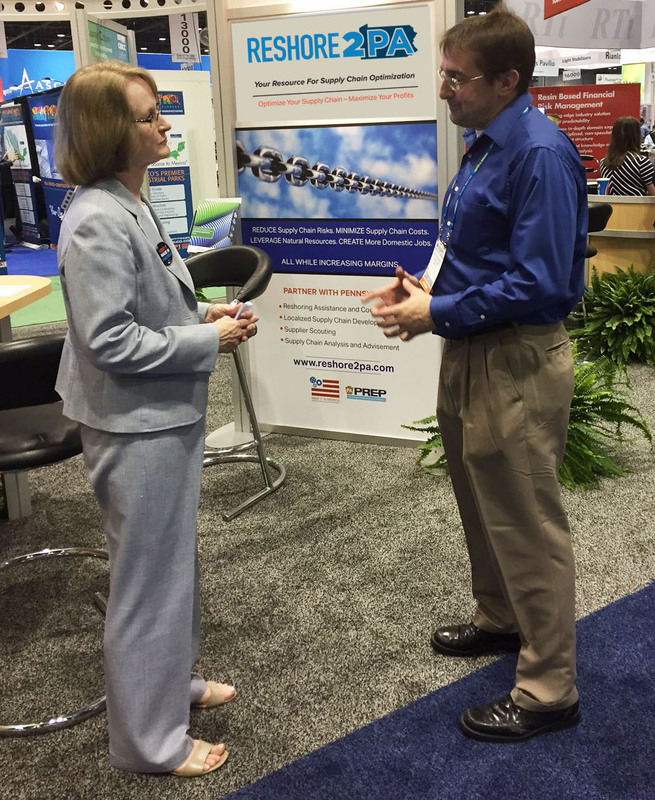 Maureen Mulcahy, NEPIRC Supply Chain Specialist, talks with a plastics industry manufacturer at NPE 2015: The International Plastics Showcase. Wilkes-Barre, PA. — Representatives from NEPIRC – the Northeastern Pennsylvania Industrial Resource Center – recently attended NPE 2015: The International Plastics Showcase, in Orlando, Florida. The organization exhibited at the event and promoted the statewide Reshore2PA.com initiative to create Pennsylvania-based manufacturing supply chains and spur manufacturing sector growth across the Commonwealth. More than 60,000 industry professionals from over 2,000 companies attended the 5-day event, which included technical and business conference sessions and programs on timely topics such as 3D printing, recycling, bioplastics, nanotechnology, and business startups. NEPIRC partnered with the Pennsylvania Department of Community and Economic Development (DCED) to attend the expo. “We were very fortunate to be able to partner with DCED and have a strong presence at the show. We met manufacturers from all over the world and informed them of Pennsylvania’s robust plastics industry and diverse base of potential suppliers to meet their needs. We were able to demonstrate how they can use the Reshore2PA site and Industrial Resource Center network to identify Pennsylvania-based suppliers,” says Maureen Mulcahy, NEPIRC Supply Chain Specialist. The Reshore2PA.com website enables manufacturers interested in identifying Pennsylvania-based suppliers for items that they currently source from outside of Pennsylvania or from overseas to easily upload product data packets, supplier qualification criteria, product cost requirements and other specifications. Potential Pennsylvania-based suppliers can then review and evaluate the opportunities and work with their local Industrial Resource Center to pursue the business. Reshore2PA.com, and NEPIRC’s efforts in support of the initiative, are funded in part by a federal Make It In America Challenge Grant that is focused on creating jobs through the growth and retention of Pennsylvania’s manufacturing economy.